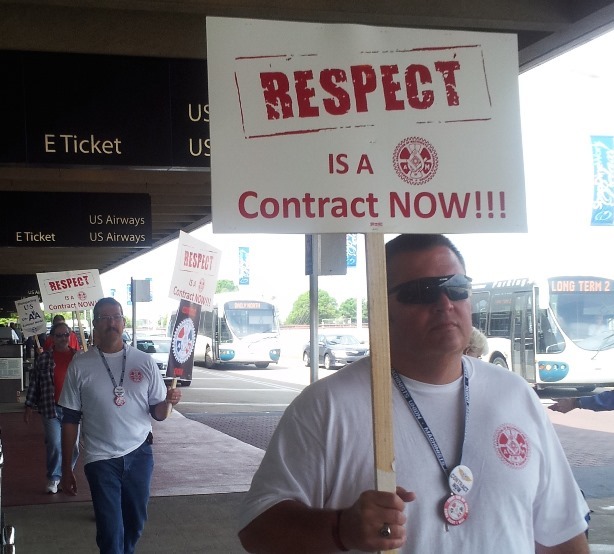 IAM members at US Airways continue their fight for a fair contract with the carrier. IAM representatives at US Airways are continuing to press the National Mediation Board for a release from mediated contract talks despite the company’s stalling tactics. American Airlines CEO Doug Parker tried to paint a rosy picture of good labor relations at the “new” American Airlines during a JP Morgan investor conference call, but the company’s actions were much different. Parker and his management team have stalled negotiations for almost three years while focusing on the merger of US Airways and American Airlines. The company refuses to settle contracts with IAM-represented employees that provide comparable wage rates to those negotiated with American’s employees who perform the same work. Even after Parker’s remarks about how good labor relations were, the company continued its stalling tactics at a meeting at the National Mediation Board (NMB) office in Washington D.C., where IAM Transportation Department officials met with NMB Chairwoman Linda Puchala. The IAM reiterated that an impasse has been reached and pressed the NMB to release both parties from mediated talks. Releasing the parties from mediation is a critical step to gain the right to strike. In a quarterly meeting in February, Parker stated that American’s goal is to achieve single joint contracts with all its labor unions. IAM members at US Airways have been in contract negotiations with the carrier for almost three years and have demanded that they settle stand-alone agreements before any joint negotiations take place. The TWU and IAM formed an official representation alliance last year after the merger of American and US Airways, and plan to combine both union’s considerable resources to represent TWU-IAM ground workers at the “new” American. The NMB has yet to issue a decision to release both parties from mediated negotiations and extend a proffer of arbitration.